When you need a service to perform at its best, it usually tends to backfire and break down. Most of the time we call it bad luck, but the truth is that we often neglect something until we need it, and by then it’s clogged up and working inefficiently. This is true for just about anything that we need repairs on. The plumber never breaks down when you’re at home and have easy access to a service – it always happens in the middle of the night and wakes you up with a few inches of water at your feet. The AC always works well, until that hot summer day when it overworks itself and backfires. That’s where Charlotte AC repair comes in to help. 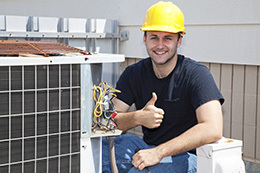 We’ll make sure that your unit is up and running in no time. If you’re looking for something that you can do so that the unit won’t break down when you need it most, we also offer maintenance appointments. One checkup from time to time can make sure that your unit is running as efficiently as possible, so it doesn’t run up your energy bills and you can come home knowing that everything will be at a comfortable temperature. If you want your days to go smoothly without having to freak out from time to time, we can’t stress the importance of having a Charlotte AC company come out to repair and maintain the unit from time to time. We promise – the payoff will be worth it. « When Do You Need The Professionals?